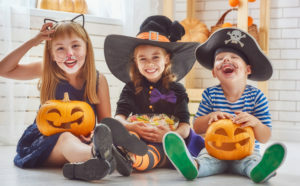 Your family dentist in Winthrop may be the last thing on your mind during the Halloween season. Still, there’s no doubt that too much trick-or-treating can lead to toothaches down the road. Happily you can lessen the odds of a sugar-coated dental dilemma by following the tips in this post. Enjoying candy along with an otherwise nutritious meal is easier on the teeth and gums than an all-out sugar fest. So encourage your little ones to save those scrumptious treats for dessert. Teach your kids to put forth a little added effort when brushing or flossing. The more thoroughly they clean their teeth, the lower the risk that cavities will start. Know which treats are more likely to cause cavities. For example, chocolate is often portrayed as the bad guy when in reality it’s fairly easy to brush away. This is particularly true for dark chocolate, which has less sugar than other types. Drinking a glass of water after eating candy is always a good idea. Not only does it help to clean the teeth, it hydrates and refreshes the entire body. Some of the most delicious indulgences on earth have no calories whatsoever. Sugarless gums are a great example. Consider adding some of these tooth-friendly treats to your kid’s candy stash this season. You can also give them out to the trick-or-treaters that come knocking at your door. Buy or bake a bunch of goodies sweetened with products like aspartame (NutraSweet®) or sucralose (Splenda®). Mix these in with the regular refreshments and no one will be the wiser. Or set aside a special tray for these snacks. Don’t forget the beverages. Have a good supply of diet sodas or other sugar-free drinks on hand and within easy reach. Remember that most forms of alcohol have some sugar, so make provision for the teetotalers among your crowd. Provide plenty of fun games and activities to keep your guests busy. That way they’re less likely to spend the evening snacking. What’s a scary movie marathon without some delicious distractions on which to nosh? If your plans for the evening’s entertainment include some frightening flicks, then consider serving up some healthy options like fresh veggies with sugar-free dipping sauces. Getting a few goosebumps on October 31 is all part of the fun. So enjoy the spooky season the smart way by using the tips in this post. That way you can show up for your next appointment with your dentist in Winthrop with both a clear conscience and a healthy set of teeth. Dr. Howard Brooks earned his DMD degree from Boston University School of Graduate Dentistry in 1987. Each year he completes ongoing education classes to keep his skills sharp. You can reach his office online or by calling (617) 846-1811.